The lost churches Part 2, St Botolph. St Botolph or St Botulph or even St Botwulf was a church named after a saint that now only really lives on in an adapted street name. Ignominiously lost in a few street signs in the precincts behind Anglia Square. 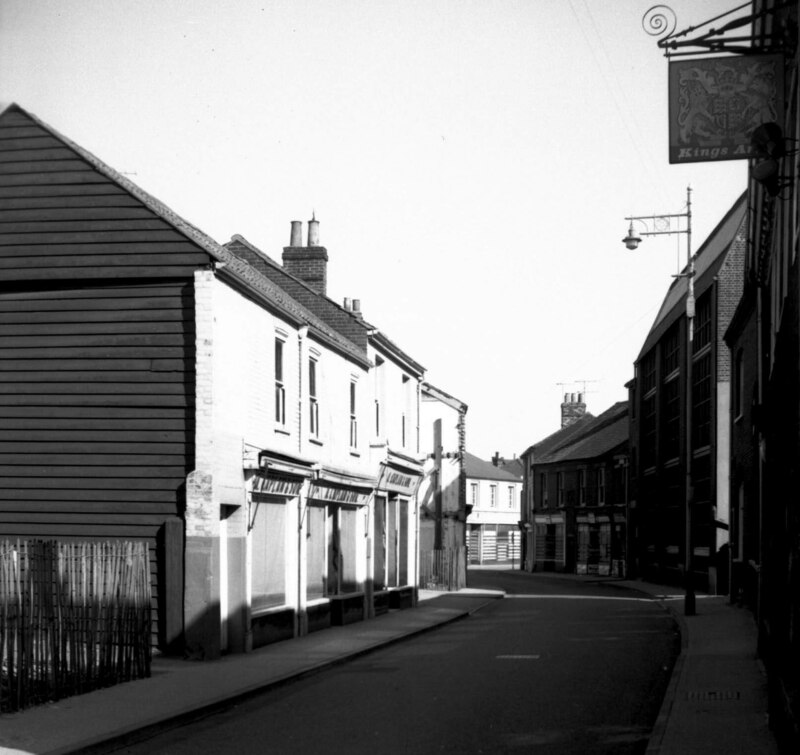 The original Botolph or Buttle street, tracked from it’s junction with Pitt Street and St Augustines, across the top of Calvert Street and then St Georges; also known as Middle Street both now truncated by the flyover; to Stump Cross where it joined Magdalen Street. A narrow dark parade full of shops, workshops and factories with at least four pubs. 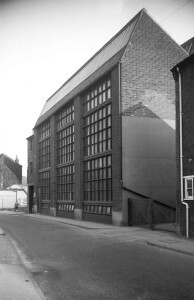 It also featured the original Norwich Odeon; a rather beautiful 1930s art Noveau picture house which stood on the North side of the street very near to where the modern, ugly and now closed multi-storey car park is. Another building of note; Chamberlins clothing factory (Pictured below) which stood slightly further down towards St Augustines roughly where Peter runs his butchers shop and the cafe serves tea and baps with a variety of fillings. It was a beautiful piece of modernist utilitarianism originally designed by A.F. Scott who also created the colonnaded frontage of Buntings, now Marks and Spencers on Rampant Horse Street. It was much admired by Pevsner; the arbiter of architectural taste who compiled endless lists of notable churches and buildings throughout the country). The street was heading into dilapidation by the 1960s, and by 1969 was demolished and cleared to make way for nothing much For a while. Half of it is now a residual piece of road with car parks either side leading into Botolph way under the overhanging cliff of Anglia Square and Sovereign House a little considered concrete lined ganglion listlessly voiding its human traffic into Anglia Square. New Botolph street tracks across what was car park joining Edward Street to Pitt Street, a new territory for buses to nose along like pigs in the slow traffic, part of the endless quest to perfect a gyratory. St Botolph himself has a particular association with a particular type of church: A Saxon noble and eventual East Anglian saint generally associated with travelling due to his corporeal remains’ post-demise activities; he got about a bit after he died as saints sometimes do. Before his death he famously built a monastery, almost certainly at Iken near Aldborough despite the best attempts of Boston to claim him. His Christian teachings and Monastery outlived him, the Danish invaders destroyed the building, but he lived on as three sets of boney relics; one went to Thorney, one to Ely and the last bit, or bits made it to Westminster Abbey, some say via four of London’s city gates Aldersgate, Bishopsgate, Aldgate and Billingsgate. Whether his remains did pay them a visit or not, each one of these city gates now has a church named after him in the very near vicinity. He is considered a patron saint of both farmers and wayfarers and it seems that his name is quite often found at gates into English cities. There are apparently 71 churches dedicated to him in England, the highest concentration being in the East with 19 of those in Norfolk. A local saint for local people. This “he tends to be found near gates” information may seem confusing, as Magdalen Gate or Fybriggate and St Augustines gate are some distance away and St Margarets (see Part 5 of this series, quite soon hopefully) is closer to the medieval gate. But then the medieval city walls are almost certainly not the original defenses. What we have left today of the wall is the defensive line which was built in 1294 and continued being added to for about 150 years right up to the point where it was no longer really needed, builders eh, marvellous, that must have been one hell of a snag list. There was previously an earlier earth rampart thrown up and ditch dug that followed roughly the line of St Georges/Calvert Street from the river, before swinging round what is now Anglia Square car park and back across to the river. This has been identified in a series of archaeological digs on Calvert Street and Botolph Street, it may have had a wooden palisade along the top, in my imaginings it has but nobody really knows. It would probably have had bored sentries playing dice, eating fried turnip chips, scratching their arses and not having a cigarette because they hadn’t been invented yet, we don’t really know this either, but I like to people my imagined pastscapes, fleshes them out a bit with noise and mess. 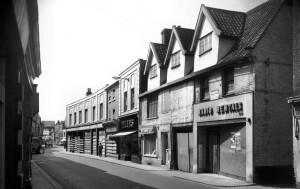 There is some evidence apparently of an early gate on Botolph Street and there may have been a gate on Magdalen Street (somwhere in the photo to the right) despite some reports indicating there is no archaeological evidence so far. Early city folk would have had to defend themselves and more importantly in reality the state would also want to tax people as they arrive, leave, stand up, sit down, eat, breath, copulate, die etc, some things don’t really change that much. Despite the hallway to hell being wallpapered with assumptions we are going to have to make one, there would have been some sort of gate and it would probably have been on a dusty packed earth Magdalen Street behind or very near St Botolph’s church. Hence the name and the association with entrances. As for the location, there’s an element of guesswork involved, Nick Groves has identified what he thinks are probably the churchyard boundaries on old maps of the city and by poring over old bits of paper about parish boundries and so on, so this is not a random stab at anything, however whatever remains will now be slightly obscured by the huge lump of brick and concrete that is Anglia Square which is still very much on top of all of it, the best guess is it’s probably somewhere under the Magdalen Street side of the 99p store or maybe toward the Anglia Square offices. There would also be a reasonably sized cemetery, human remains were indeed found in a 1960s dig. To quote from Francis Blomfield (History of Norfolk Vol 4 1806) St Botolph church was situated “more south in Magdalen Street, not far north of Stump Cross; its churchyard abutted east on the said street and west on St Buttolph’s, commonly called Buttle-street; and is now the White-horse-yard.” this gives us a fair idea of where it might have been by laying old maps on top of new ones. 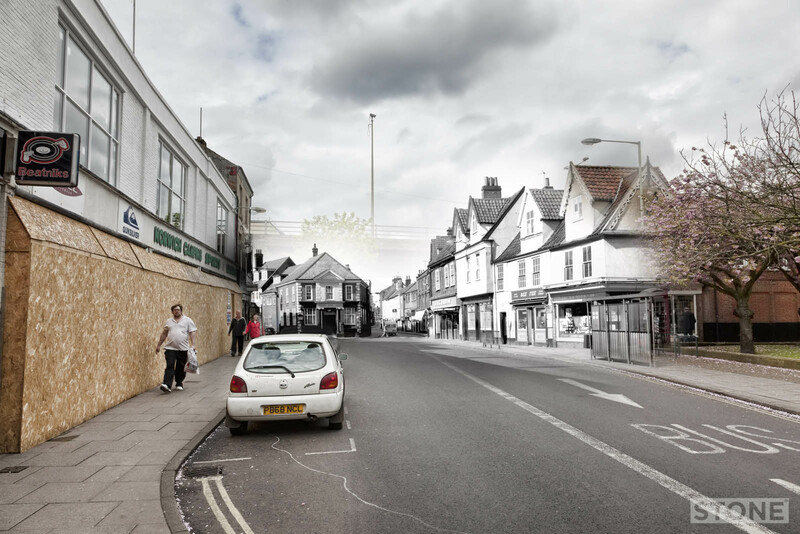 As to where it went, it vanished long before 1960s town planners could have done any damage. In 1505 William Stephens, the last Rector of St Botolphs died. In 1544 it was made a private property, passed to St Faiths priory. Henry VIII then he gave it to William Godwin. By 1548 the church had been demolished and as with all the other parishes in the vicinity it was united with St Saviour’s just over the road on the other side of the flyover of the future. In the 1960s there was a watching brief; archaeologists keeping an eye on the spoil and any earthworks going in when Anglia Square was being built. Hopefully there will be at least a similar brief or maybe a dig in twenty-god-knows-when or whenever it is Anglia Square meets it’s maker as it’s predecessors have. You just have to hope that not too much of the area was destroyed by footings and cellars in previous times and there is something that can give us a few more clues to the position of the church itself and what it was like, maybe some more souls will be found and examined in the surrounding churchyard too. There is still hope in memory; if and when the Square is done for and a decision is signed as to what supermarket chain is going to be there gradually closing all the local shops and clagging up the roads with cars trying to park, it will at least, if the plans remain vaguely similar to now be called Botolph Square. I think is a rather nicely shaped elliptical thought. Main photo: Stump Cross Ghost ©Nick Stone, Original photo Picture Norfolk. 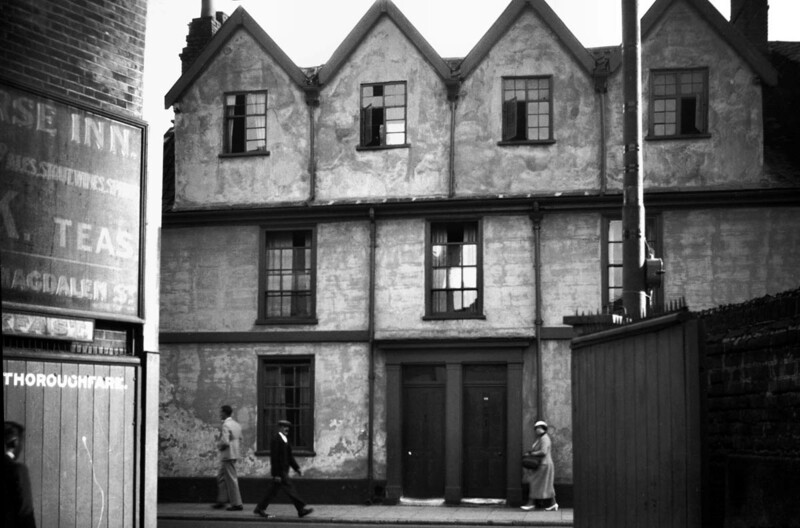 Other photos: Botolph Street 1936 ©The estate of George Plunkett. Courtesy Jonathan Plunkett. Thanks again to Nick Groves for his assistance. Find out more about Norwich’s historic churches at Norwich Historic Churches Trust.